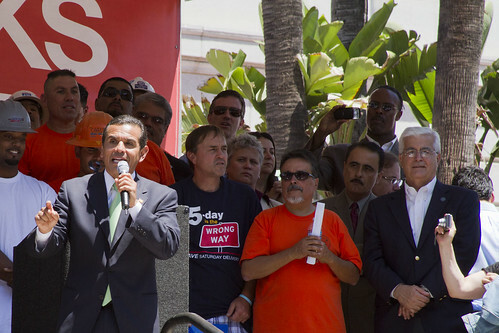 Last Friday a huge labor rally – I’m talking thousands of people – took place on the front lawn of L.A. City Hall. 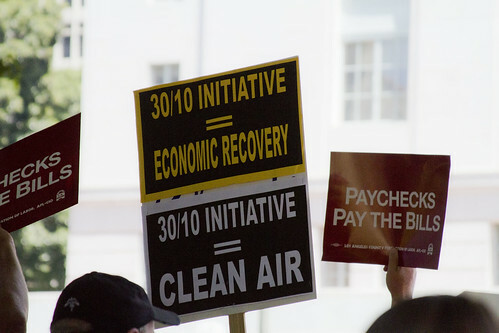 The 30/10 Initiative was the unifying theme. The vast majority of attendees were there representing various labor groups, but there was a contingent of transportation advocates and environmental groups in the mix. The above video has the transportation related highlights from speeches by Los Angeles Mayor Antonio Villaraigosa, Sen. Barbara Boxer and Rep. Jane Harman. Harman revealed that U.S. Secretary of Transportation Ray LaHood supports 30/10 but noted that he needs to announce an Early System Work Agreement (ESWA) to ensure federal dollars are available sooner rather than later for two projects, the Westside Subway Extension and the Regional Connector. A few images from the rally, after the jump. 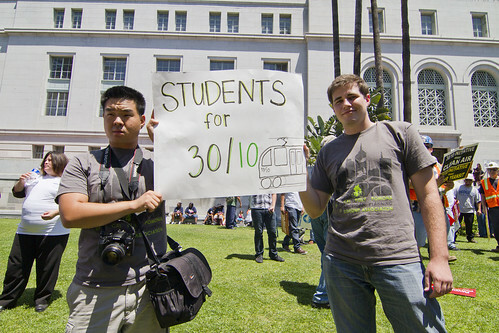 Planning students from Cal Poly Pomona show their support for 30/10. Mayor Villaraigosa speaks of the importance of 30/10 to a crowd of thousands. Jobs and economic recovery were the focus, but transportation and the environment were not forgotten.